Chris Brown’s probation hearing was pushed back to give authorities more time to complete a probation report in the singer’s assault case. The R&B singer had been scheduled to appear in court on Monday for the first time in more than a year, but the Los Angeles District Attorney’s office says the proceedings are being delayed for a week. A judge has ordered an audit of Brown’s community service after a prosecutor said there were some questions about how many hours he had actually performed. 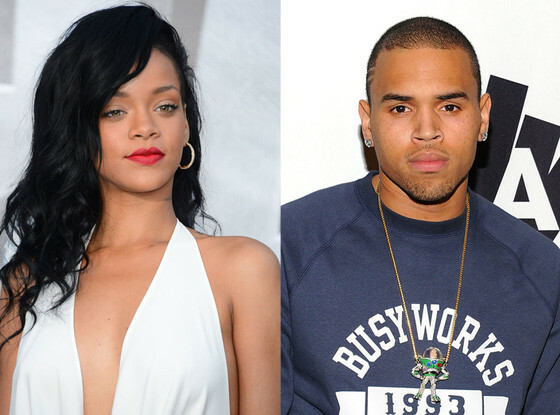 Brown is on probation for the 2009 beating of his then-girlfriend Rihanna and had been ordered to perform six months’ worth of community service, including graffiti removal, roadside cleanup and other manual labor. Brown has so far completed his terms with praise from a judge. Was it just a simple greeting? Was it more? Does it matter? Rihanna and Chris Brown were spotted exchanging a, um, warm embrace that brought up many questions, which were followed by head-shaking and sighs. So what the h-e-double hockey sticks is going on here? 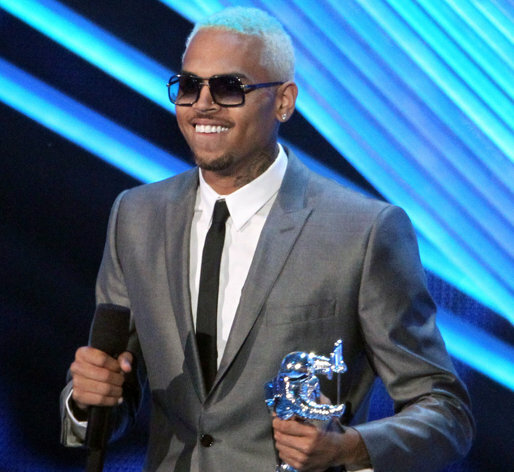 Read the best and worst highlights from the VMA’s! 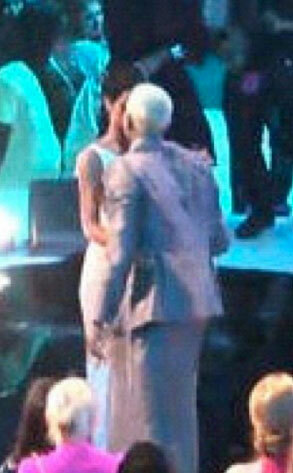 At some point during tonight’s MTV Video Music Awards, Ri-Ri was caught giving Breezy a kiss while passing through the crowd. And granted, this photo doesn’t exactly tell whether it was a friendly peck on the cheek or a slightly-more-than-friendly peck on the lips, but regardless, the shock value is still the same. Rihanna has openly said (to Oprah Winfrey, nonetheless) that she and Brown have rebuilt their friendship and that she still loves him, not to mention also acknowledging that Chris is in a relationship. Rihanna and Chris Brown Are Sitting How Close?! The list of celebs who’ll be hitting this Thursday’s MTV Video Music Awards just keeps growing and growing! Rihanna, Katy Perry, Miley Cyrus, Taylor Swift and One Direction are just a few of the bold-faced names who will be in the house during this year’s big show. We got a sneak peek earlier today at the Staples Center of where all the A-listers will be sitting and noticed, interestingly enough, that RiRi and her former flame Chris Brown aren’t sitting too far away from each other. Rihanna and Brown are both seated in the front row just seven seats apart. The guys of One Direction and Pinkwill be seated just between the one-time couple. To Rihanna’s other side will be her pal Perry with Drake,Nicki Minaj, Lil Wayne and Swift seated down the same row. Cyrus and Demi Lovato are in the second row just behind Rihanna and Perry. Other stars in the crowd include Chord Overstreet,Ke$ha, Andy Samberg, Rashida Jones, The Wanted,Rita Ora, Alicia Keys and Emma Watson. The U.S. Olympics women’s gymnastics team will also be presenting during the show. So which celebs are the “Fierce Five” most excited to see? Rihanna will open the big show while Minaj will appear as a special guest performer with one of the previously announced acts which includes Swift, Green Day, Alicia Keys, Pink, One Direction, Lil Wayne and 2 Chainz. Pop singer Rihanna has returned to the top of Britain’s album rankings with her album “Talk That Talk” after a run of 38 weeks in the Top 40, the Official Charts Company said on Sunday. It is only the second week the album has been in the number one spot as it nears 1 million British sales. The recording has been a huge hit around the world and helped the Barbadian star to earn an estimated $53 million in the 12 months to May this year, according to Forbes magazine. East London rapper Wiley topped the singles charts for a second week with “Heatwave”, his first solo British number one. British pop band Lawson were the week’s highest new entry at number three with their single “Taking Over Me”. Redlight, a DJ and producer from Bristol in southwest England, was also new in fifth place with “Lost In Your Love”.